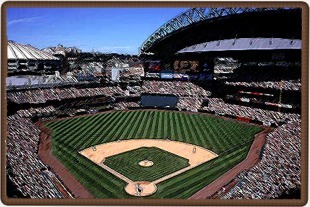 Since the Inaugural Game on July 15, 1999, Safeco Field gained a reputation locally, regionally and nationally as a terrific setting for baseball and a great place for baseball fans. Sweeping views of the downtown Seattle skyline and breathtaking sunsets over Puget Sound combined with excellent views of game action from all angles to give fans at Safeco Field an experiences unequalled in Major League Baseball. A large number of fans take advantage of the openness of Safeco Field and enjoy watching games from standing areas at various locations around the ballpark. The patio of the Bullpen Market in center field has become an event within an event as thousands of fans gather there for festive atmosphere before and during games. Fans also take advantage of the fact they can make a complete circle of the ballpark on the main concourse while still watching the game.